We’ve had a lot of good chats with jewelry designer Philip Crangi and his sister Courtney over the years, but never on the subject of jeans. 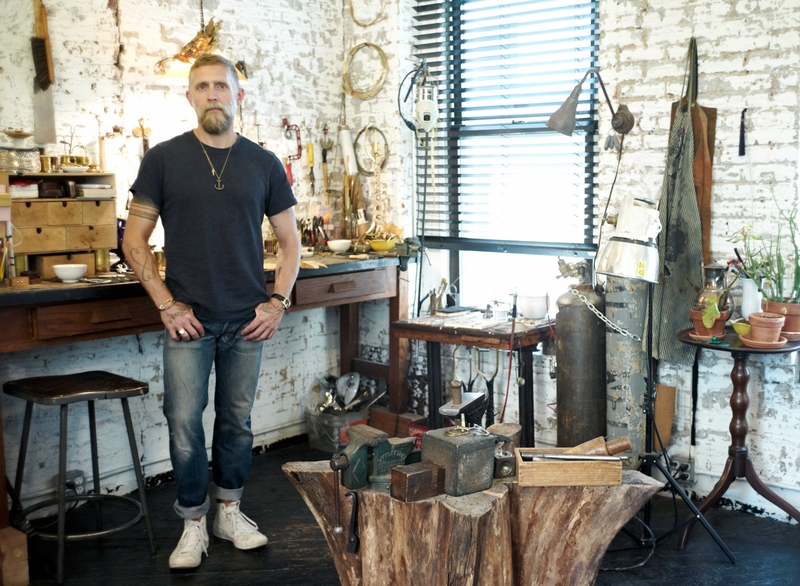 Philip’s jewelry, however – from his fine collection and the more rugged, brass-based Giles & Brother line – looks so perfect worn with a pair of jeans, and share many of the qualities often found in the most exceptional pairs: authenticity, personality, and an easy, unpretentious spirit. Of course, we weren’t surprised to learn that Philip, being the craftsman that he is, does the A.P.C. thing, buying his raw and following all the rules until they break (the jeans, not the rules). Nor were we all that shocked to see Courtney in Chimala’s, the artisanal Japanese brand championed by Madewell (Courtney’s girlfriend is J. Crew’s president and executive creative director Jenna Lyons, and Madewell is J. Crew’s sister brand). 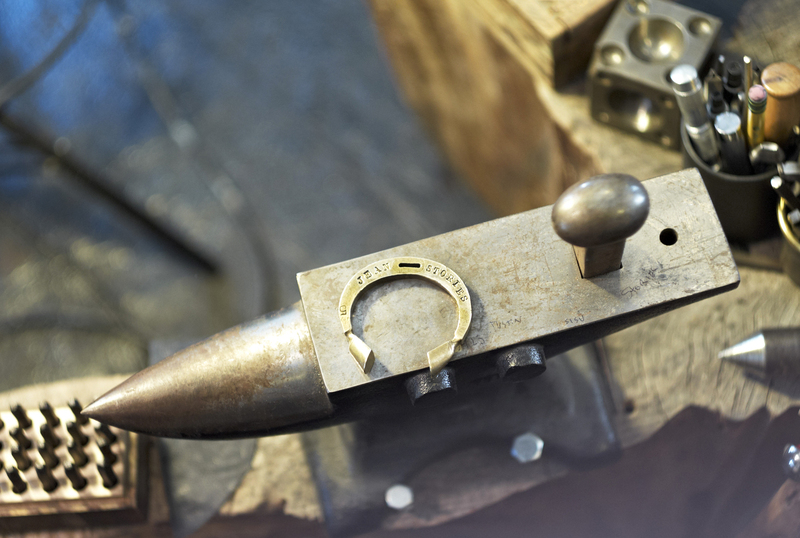 But it’s the way these two personalize their jeans – like the way men and women personalize the iconic Giles & Brother railroad spike bracelet by hammering their names or initials into it – that makes their story compelling. Let’s start by talking about your jeans. What are they and where did you get them? Courtney: My jeans are Chimala and they’re from Madewell. I’ve been wearing them for over a year. Before I got these, I’d been wearing really tight jeans. Now I really never want to put anything sucking-in or too-tight on my body again! The thing about Chimala is that every pair is handmade by Japanese artisans. They are really expensive, but they’re really worth it. Philip and I always do the cost/value ratio, like the price-per-wear thing – dividing how much something costs but how often we wear it. These, I wear a lot. I don’t own a lot of clothes, but when I buy something it’s an emotional purchase, and I wear it over and over again. There have been times when I’ve worn these jeans three or four days in a row. And I will totally wear them as a Canadian tuxedo, with a denim shirt, too – denim head to toe. Philip: Same here. I am a big fan of the Canadian tuxedo. It’s an autumn look for me. It’s like a jean jacket and a pair of jeans and a t-shirt. 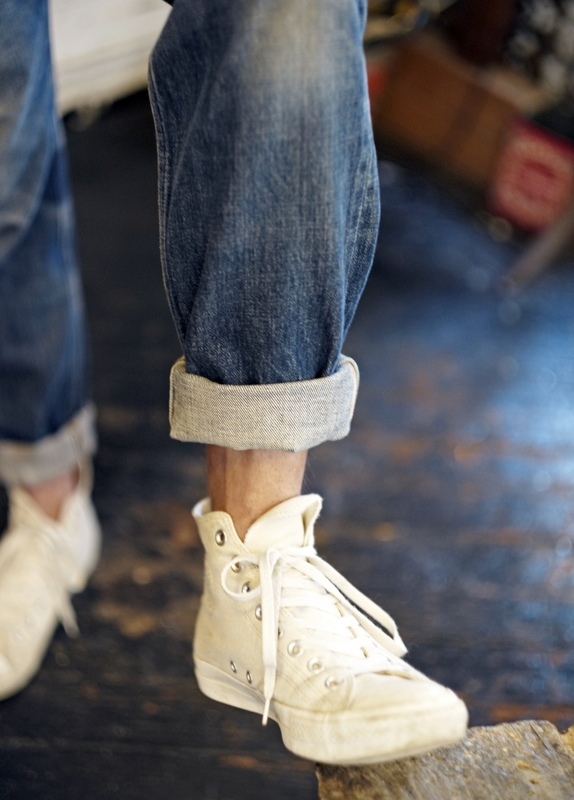 That, with a pair of Converse, or an Oxford shirt – if I had a uniform it would be that. It’s such a perfect American look. And you both can wear jeans everyday if you wanted to? Courtney: I mean, yeah, I could. Though I do like to change it up. 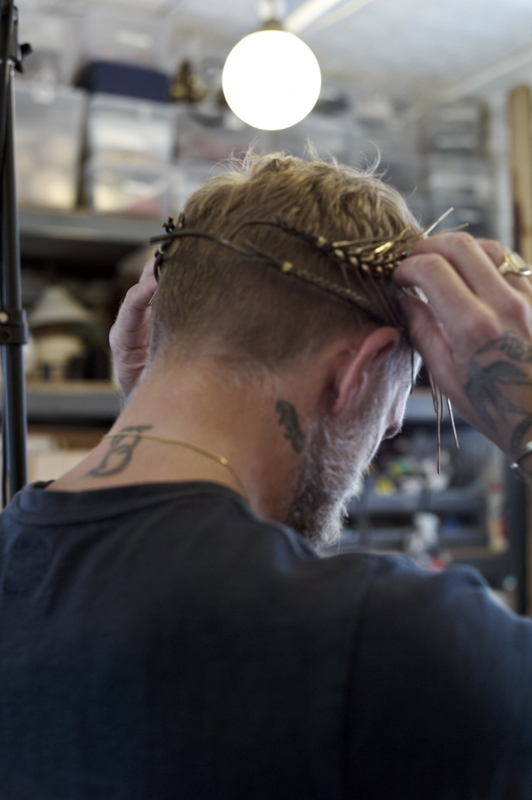 Philip: My work and outside-work lives kind of blur, because I don’t necessarily need to dress for work. I dress for life [laughs]. Philip: A.P.C.s. And I have definitely worn jeans, probably this very pair, every day for months on end. It’s not so much about a uniform, but I get into a mood and then I just stick with it. Jeans are so much a part of that. Lately, I’ve cycled into a different kind of classic American look – chinos with Converse high-tops, as opposed to jeans with Converse high-tops. But funnily enough, having put these A.P.C.s back on today, I realize why I love them so much, and I think I’m going to be wearing them a lot more often. 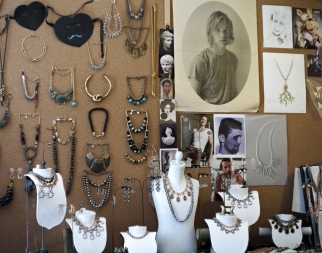 Is there a connection you can make between your jeans and the jewelry that you design? Philip: I mean, what we tried to do with Giles & Brother is create a certain kind of confidence; it’s a little bit asexual, like a uniform for men and women. Philip: It’s handsome, yes; and it’s a strongly indentifiable American look. 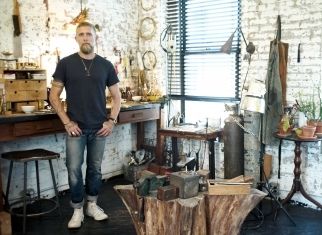 Courtney: Yeah, with Giles we’re taking a kind of non-denominational, symbolic American style, and we’re always sort of nodding to a nautical theme – the raw brass, the raw cotton rope. But there’s always something that feels really American about it. And I think that’s what denim feels like. 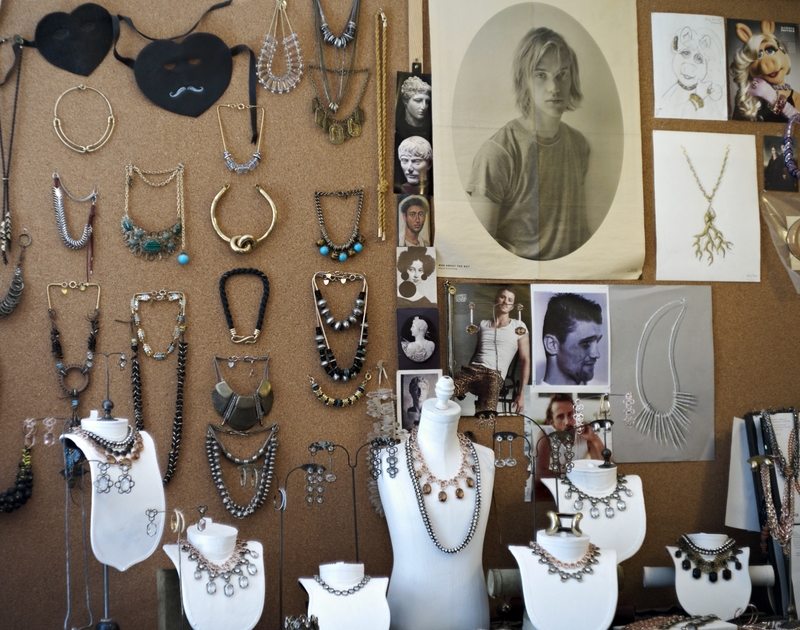 When you look at our jewelry you don’t really know how to place it, but there’s something nostalgic, and it feels very personal. Philip: And familiar. Giles is new, it’s fresh, but there’s a strong connection you have to it immediately, because you already understand it. And the value is less in the material thing – because it’s brass, it’s rope – and more in the way you wear it. Denim is sort of the same. Although jeans can be an extraordinarily expensive thing, denim isn’t always, and it’s really about the attitude and the way that you wear it. 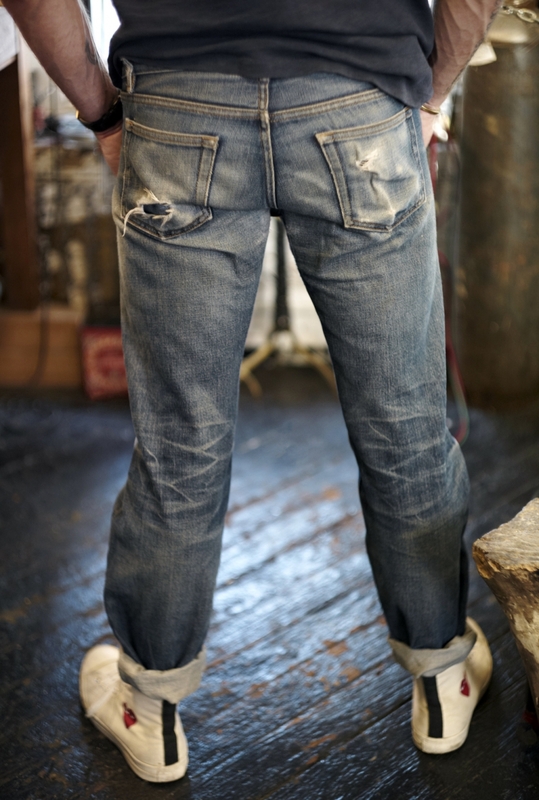 Can you tell us about some of the other jeans you’ve loved in your life? Courtney: I have a pair of white ones from H&M – I think they are about five years old, and every time I wear them people are like, “Where did you get those jeans?” And I’m like, “H&M!” I can’t part with them because, for whatever reason, they are so good on my body. I have a tricky body shape – I’m so straight that it can be hard for me to find pants that fit. I also have a pair of Victoria Beckham jeans in this really stretchy fabric that are awesome. Philip: Those look great on you, those jeans. Courtney: Well, thank you. They’re like [makes a sucked-in face], and they’re just so good. Philip: Are they like Spanx pants? Courtney: Yeah. Basically. I got them on Net-a-Porter. You know, sometimes we women just want things to fit and feel good, and the Victoria Beckham jeans do that. And girls just don’t want to look fat [laughs]. Philip: Until recently I had the very first pair of Helmut Lang jeans that I bought in, like, 1997 at the old store on Greene Street. They disintegrated to the point where they were just patches on patches on patches, and they became unwearable, so I had to retire them. Philip: I kind of went through a phase back in 2004 where I was having my A.P.C jeans tapered at the dry cleaner’s and made really skinny. The skinny ones that they make have a longer rise, and so I would wear the hipster one, cause I needed the shorter rise, and I would make the legs really, really skinny. I had a bunch of those, but I can’t believe that I ever wore them. They’re too skinny. Courtney: And there are the ones we wore as kids. We used to get a pair of overalls and a pair of button-fly 501s from this Western-wear store called Griffs in the Everglades, where we grew up. We were in the sticks. And when we outgrew one pair we’d just go and get another. 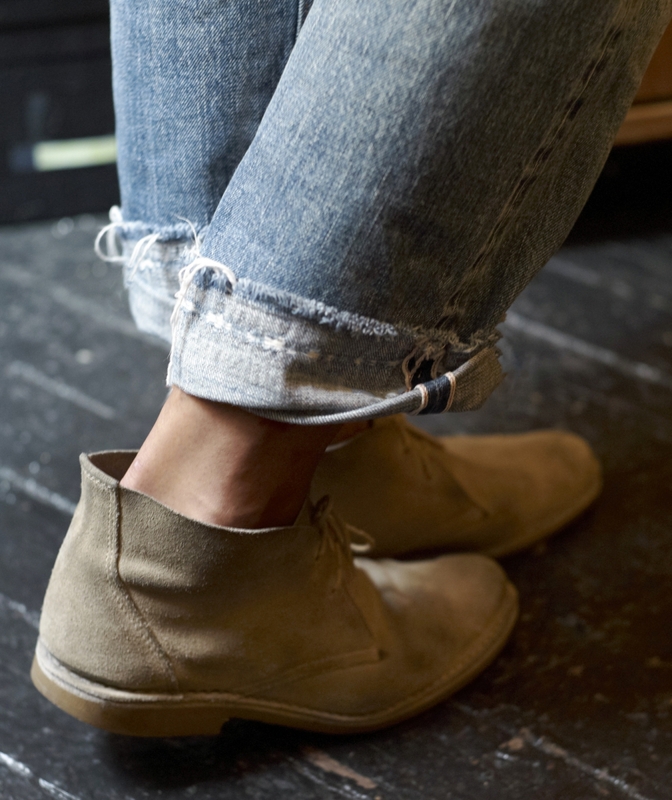 I remember putting my legs through the 501s for the first time and it was like separating cardboard – so uncomfortable! But our parents really insisted on Levi’s. We were a Levi’s and Coca-Cola family. And Colgate toothpaste. Never Crest. But we broke our jeans in. Philip: And mom was always in jeans, real 50s-style, with a cuff and a high waist with her shirt tied in the front. Drinking a coke out of a bottle. Courtney: And then she’d wear jean shorts. She had an amazing body – she still does.